NOTES: depending in weather conditions, event date might change. Please check for updates regularly. Note that I am not taking responsibility for your safety during the walk. As I am not a professional guide, this is just an invitation if you want to join me for a walk. Please read all the details of this walk before you sign in for this event!! The Kiama Coastal Walk is a great way to see the beautiful coastline and hidden beaches and bays that Kiama has to offer. The first section begins at Protected content you can park your car for free and start walking heading south. This section takes you past Jones’s Beach into Cathedral Rocks ( boneyard beach ) around Bombo Quarry, across Bombo Beach and up to the Lighthouse / Blowhole via the harbour. If you were wanting to do the complete loop you can either walk back or catch the train from Kiama station to Protected content . This section can take up to 3hours depending on how fast you walk or if you decide to take a dip. Next section is from the lighthouse / Blowhole to Kiama Hights ( south Kiama ). 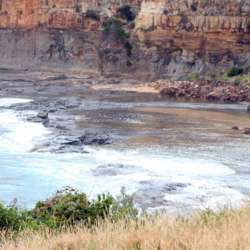 In this section you will walk past many of Kiama’s more popular beaches including Surf Beach, Kendalls Beach, Easts Beach passing by the smaller yet just as good Little Blowhole and finishing up at Loves Bay. This section roughly takes around 90mins or so. Please note that this walk is approximately Protected content long and it is one way. Therefore, please think twice if you can do it, before you sign up for this event. Previous bush walking experience and more than above average level of fitness are required for this walk. We will have to keep average/high pace to get to Gerringong on time for the last convenient train connection. With some short breaks for snacks and lunch, of course. Please wear enclosed sturdy walking shoes (preferably hiking boots), bring weather protection according to weather forecast, insect repellent, sun protection, hat, sun screen, plenty drinking water Protected content snacks and lunch. Lunch stop will be in Kiama, at about 2/5 of our walk. There are several beaches along the walk, and depending on how we go with time, we might make longer break at Gerringong, before we take train back, for a swim. So definitely take your swimmers with you. Please remember to subscribe only if you are sure you can attend. If something comes up and you are not able to join, please cancel your attendance 24 hours in advance! We will go there by train. Before you join this event, pay attention how often train goes and how long does it take to get there and back.